After Christmas and new year celebration, now we Bengali are celebrating our winter festival Poush Parbon. Rice flour made with freshly harvested rice, Date jaggery, coconut and Milk created tons of memories in many Bengali Kitchen! Cooking with my daughter is one of our favourites activity during school holidays, this way I love to introduce her our festivals, traditional foods, I tell her my childhood stories! This weekend we made Chusi together for Chusir Payesh! Some people call it Hate Kata Semai ( Handmade Seviyan) or Chui Pithe. I was telling her how we used to enjoy our school holidays in Mamarbari ( maternal grandparents house) with my cousins, Masi( Aunts) and my Dida ( grandma) used to make all these Bengali delicacies for us! Not only that, but the everyday meal was a feast! When I tell her my childhood stories, then I also revisit my childhood! Win-win isn’t it. Hope this winter you all are going to create some delicious memories as we did! 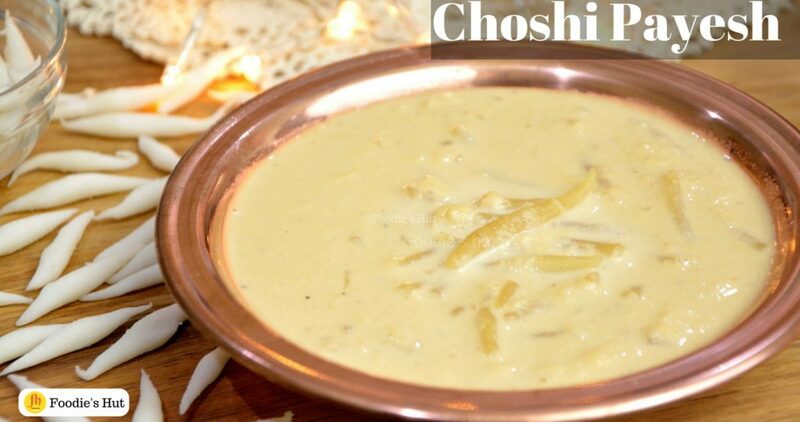 Here is my version of Choshi-r Payesh recipe. Pour Milk into a heavy-duty saucepan or Kadai and let it boil over high heat. Once it starts boiling, reduce the heat to medium-low and let it simmer for about 20-30 minutes to thicken up the milk. While the milk is boiling, you can start making Choshi. Boil water in another saucepan, save some boiling water in a cup, just in case it required. Remove the saucepan from heat and add rice flour little by little, with the help of a spoon tries to bring the mixture together. Cover with a lid and give ten minutes resting time. When the rice mixture is warm, start kneading it to make a dough.Then cover with a lid and give another fifteen to twenty minutes resting time. On clear and clean surface dust with some rice flour. Take a lime size small portion of the dough, roll it on the surface to make a thin log. Nip tiny portions from the rice flour log and roll in between your palm cylindrical shape. Keep repeating until you are done. You can put them in a glass container and store in the refrigerator up to two weeks. Next, add sugar to the boiling milk, let this cook for 5 minutes or so. Then reduce the heat to low! On the other burner, heat up another cooking pot, add in jaggery and a little bit of water, over medium heat stir it and let it melt. When the melted jaggery bubbled up, in it, add Choshi, a rough guide, for one ltr Milk I add 1 cup or 1 ¼ cup Choshi. Let them simmer for about 3-4 minutes over medium-low heat; stir them gently. Then take two or three ladlefuls of milk and pour in the Choshi mixture. Give a stir, then transfer this mixture to the Milk. Cook for about 5-6 minutes or until it gets a bit thick. Turn off the heat, cover with a lid.it will get a bit thick when it's cool. 1) For 1ltr milk, I add 1 or 1 ¼ cup Choshi 2) You can prepare the Choshi and store in the refrigerator for up to two weeks.